We’re ready for some Monday Night Football. Tonight we have a double header featuring the Baltimore Ravens (-7.5) hosting the Cincinnati Bengals, followed by the Oakland Raiders (+1) hosting the San Diego Chargers. I’m not touching the Raiders/Chargers game, but the Ravens/Bengals is worth looking into. We hit our big-money play to open the season. Our first 9/10 confidence pick on the year was a winner thank to the Texans, who took care of business against the Dolphins. Unfortunately, I then decided to play with the house’s money and made some small plays in the later games only to give a small portion on those winnings back, but hey, it was free money to play with. I got a little over eager due to finally snapping my football withdrawal, but we just have to stick to our method of identifying one or two key games each week and taking them down hard. Let’s see what we have tonight. I would first like to note the action on this spread since it opened. The line opened at Ravens (-6) before moving to Ravens (-7.5) before settling back down to Ravens (-7). 84% of bettors taking the moneyline have the Ravens. 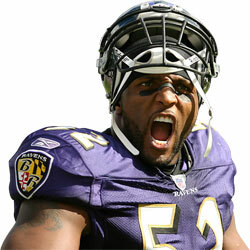 63% of the public is taking the Ravens against the spread. 64% of the experts at covers.com like the Ravens. Over the last 3 years, these teams are 3-3 head-to-head. Cincinnati has the edge with the spread with a 4-1-1 record ATS. The Ravens have won three straight against the Bengals, while the Bengals won the three games before that. Last year the Ravens won both games. On November 21 in Baltimore, the Ravens won 31-24. On January 1 in Cincinnati, the Ravens won 24-16. The Ravens are 3-1 against the spread at home since 2008 against the Bengals. In the first game, the Andy Dalton came out firing. Throwing for 373 yards, but also throwing 3 INTs in the process. Jerome Simpson was his man in that game with 152 yards on 8 receptions. Simpson is now with the Vikings. Torrey Smith had a huge game for the Ravens with 8 receptions, 165 yards, and 1 TD. In the second game, the Ravens pounded the football down the Bengals throat. Ray Rice had 191 rushing yards and 2 TDs. Dalton threw for 232 yards, 22/44, 0 TDs, 0 INTs. A.J. Green was shut down. He had 9 targets, but just 2 receptions for 26 yards. What’s more telling is that Dalton completed only 50% of his passes and had an awful 5.3 YPA. Bengals are 0-6-1 ATS in their last 7 vs. AFC. Bengals are 0-4-1 ATS in their last 5 vs. AFC North. Bengals are 0-3-1 ATS in their last 4 games as an underdog of 3.5-10.0. Ravens LB Terrell Suggs is out. Bengals CB Dre Kirkpatrick (their 2012 1st-round pick) is out. The Ravens still have Nate Clements and Leon Hall as their CBs, two quality corners. The Bengals also have nasty safety duo of Reggie Nelson and Taylor Mays. Bengals lost their starting left tackle and center. That could be a bigger problem. The history and the rankings make everyone think that this will be a tight one, especially with the spread. That may be the case, but I’m going to lean Ravens in this one for a few reasons. The Ravens went 8-0 at home last season. The Ravens are also 4-0 in their opening game with Coach Harbaugh. Huge edge for the Ravens to open up the season at home in the lights. I think you’ll see an improved Ravens offense, especially their passing offense with the maturation of Joe Flacco and Torrey Smith. Smith is poised to have a breakout season and had a lot of success against the Bengals last year. Dalton also struggled against the Ravens. In his first game against the Ravens he throws 3 INTs, in the other he completes just 50% of his passes. Jerome Simpson left the Bengals to head to Minnesota, which is a tough loss for the Bengals and Andy Dalton. That loss will give defenders more opportunities to double cover A.J. Green, who struggled last year against the Ravens. I’m going to respect the Bengals defense though. The Bengals have a stellar secondary and a decent pass rush, which is holding me back from making this an 8/10 confidence play. Although the Bengals are without Terrell Suggs, they have enough to still give the Bengals fits tonight. With the Bengals without their starting left tackle and center, the Ravens will be able to bring significant pressure and rattle Andy Dalton as they’ve been very good at doing. All-in-all, I think the Bengals take a step back this season as last season they overachieved. This game could be a tight one when you take the spread into consideration, no doubt about it, but I’m going to go with the Ravens at home. Initially, I had the game at an 8/10, but I’m going to scale the pick back to a 7/10 and approach this one a bit more cautiously due to a quality Bengals defense. I would take this line at -6.5, but not at -7.5 as I’ll predict a 7-point win by the Ravens. This pick still warrants a small play, but I’ll wait to see the week 2 spreads before throwing big money down. Iam reading this at halftime, and I am impressed. Great write up, good info with the history and solid bet recommendations. Thanks for taking the time to do these write ups. keep up the good work. I am a lifetime Charger fan, and i dont blame you for not touching the SD/Oak game, who knows which charger team we will see tonight, Dr jekyll or Mr. hyde. As for me iam just throwing a small bet on the under to sweat the game. GL all. Thanks for the respect. You had a hell of a week 1 in the pick ’em league going 9-5. Is this the year of The Moose? Well played sir. Good luck to your team tonight and throughout the pick ’em challenge. Chargers/Raiders games can get a little too crazy for me. Go Ravens!